BOGOTA, Colombia -- An avalanche of water from three overflowing rivers swept through a small city in Colombia while people slept, destroying homes and killing at least 193 unsuspecting residents in their sleep, authorities said Saturday. The Colombia Red Cross said 220 people were missing and 400 were injured in the incident. 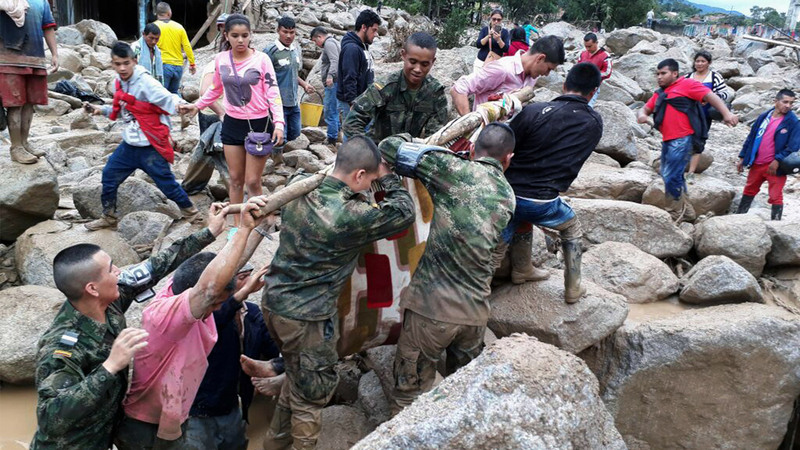 The mudslide was triggered by intense rains happened around midnight in Mocoa, a city of about 40,000 located near Colombia's southern border with Ecuador that is tucked between mountains at the crux of two rivers. Muddy water and debris quickly surged through the city's streets, toppling homes, ripping trees from their roots, lifting cars and trucks and carrying them downstream. Many of the residents did not have enough time to climb on top of their roofs or seek refuge on higher ground. President Juan Manuel Santos warned the death toll could continue to rise. "We don't know how many there are going to be," he said of the fatalities when he arrived at the disaster zone. "We're still looking." "There are many people looking for their relatives," said Oscar Forero, a spokesman with the Colombian Red Cross. Herman Granados, an anesthesiologist at the local hospital, said he arrived early Saturday morning and worked throughout the night on victims. He estimated there were at least 300 people injured and said the hospital doesn't have a blood bank large enough to deal with the magnitude of the crisis and was quickly running out of supplies. He said some of the hospital workers came to help even while there are own relatives remained missing. "Under the mud," he said, "I am sure there are many more."